When it comes to floor cleaning at some point in time gum will need to be removed from the floor. This is true whether it is in a home or in a commercial facility. However it is equally important of how gum is removed on hardwood floors during the hardwood floor cleaning process. The reason why how gum is removed during hardwood floor cleaning is important is the type of protective coatings used on hardwood floors. 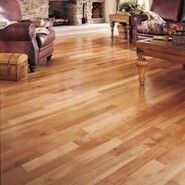 Most hard wood floors are protected from water damage and foot traffic using a urethane finish or sealer. Regardless if the floor finish and/or sealer is water based or oil based finish or sealer, this types of protective hardwood coatings are less flexible than floor coatings used on other types of flooring such as VCT tile. This makes the protective coatings used on hardwood floors harder but more brittle which makes them susceptible to damage if harsh techniques are used when hardwood floor cleaning. This article addresses the most common way of removing gum from floors and what the best way to remove gum while hardwood floor cleaning is being performed. It covers the techniques and the tools to use to reduce damage to the hardwood floors. In the event you were interested in daily or routine cleaning steps for hardwood floor cleaning, please click on the following link to take you that article (How to Clean Hardwood Floors – Simple Regular Cleaning – Commercial) or (Wood Floor Cleaning – Procedure Cleaning Steps For Residential). Note: Always remember when cleaning wood floors; always use the least amount of water possible. ICE: The best way to remove gum hardwood floors is to use Ice or an Ice pack to harden or freeze the gum. Use a plastic blunt scraper and never use a sharp metal putty knife. Sharp or metal scrapers or putty knives can damage the protective hardwood coating. Procedure: Apply ice to the directly to the gum until it hardens or freezes tot eh point that gum is hard enough to chip off with a blunt plastic scraper. Sweep the harden gum pieces from the floor and continue your normal wet cleaning of the hardwood floor. Aerosol gum removers also freezes the gum which makes the gum brittle and allowing it to be chipped off the floor. However, overspray of the aerosol gum removers will also freeze the immediate area of the hardwood floors protective costing making it even more brittle than normal. This could cause damage when scraping off the brittle gum. Chemical Gum Removers maybe too harsh on the protective coating of the hardwood floor. During the hardwood floor cleaning process, caution should be used to never use any cleaning chemicals that may damage the floor or the protective coating.